After a post here a few weeks ago here about the new Found Magazine book, Found co-creator Jason Bitner sent me a copy of his new book, LaPorte, Indiana. I was excited, since I've been obsessed with found photos since college, when I found a box of family photos from the 1890s-1970s at a thrift store in Ybor City, Florida. Since then, I've collected about 200 (including a pendant that I wear on a necklace of a little boy from the 70's I call "Chip.") Hopefully I'll get to share some of them here during my guest blogging tenure. 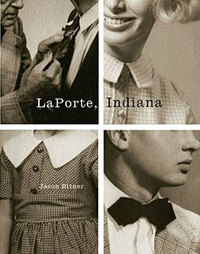 Anyway, the story behind LaPorte, Indiana is this: a few years ago, Jason Bitner discovered a treasure trove of over 18,000 portrait proofs leftover from a portrait studio that served the citizens of LaPorte in the 50's and 60's. He went through them and chose his favorites and made them into a book. When I first got the book last week I was rushing to the subway. As I walked I flipped through it and was surprised to see that aside from the foreward and Jason's brief background story in the front of the book, the rest was just the photos. It just seemed so...simple. But I got on the crowded train at rush hour and found a seat and started from the beginning. Within about a minute, I was frantically searching my bag for a tissue for the tears streaming down my face. I felt exactly the way I did the first time I opened my first box of found photos - there's something extraordinary about the cumulative effect of all these faces of real people whose lives are (probably) over. The Smiths song "Cemetary Gates" started going through my head: "All those people, all those lives, where are they now? With loves, and hates and passions just like mine, they were born and then they lived and then they died." You can see some of the photos here , but I highly recommend sitting down with the book and getting the full experience. Book report ending in 3...2...1: just don't try to read it on the subway! For the many who also knew and loved Ben, I share your heartbreak. I'm just not ready to write about him here yet, but Sarah, Jen and Amanda have posted loving tributes on their sites.